Crime | Strike of Lightning! In six years there have been 26,000, 856 children arrested for federal crimes, according to the Attorney General’s Office (PGR). In addition, many of them have been prosecuted for other crimes: 11,000,548 children and adolescents, in fact, face murder trials. In response to requests for information, the PGR revealed that most young offenders are involved mainly in drug crimes, such as trade, possession and consumption of drugs, as well as for carrying prohibited firearms. In 2007, the number of minors arrested was 4,821. And in 2008, reported the capture of 5,338; in 2009 the number grew to 6, 206 in 2010 the figure was 7,0 22 and between January and June this year 3,126 juvenile detainees . Some of the most notorious cases of child murderers are brought to discussion the issue of legal age, if you should be lowered to 16 years or less, because of the violence displayed by some of these offenders. – In December 2010, Mexican soldiers captured in Cuernavaca to Edgar N. known as El Ponchis, less than 14 years, whom he described as chief of hitmen Edgar Valdez Villarreal, La Barbie . – For internet videos that circulated this teenager murdered in cold blood some people, slitting their throats in front of the cameras. – According to statements, the Ponchis joined the ranks of organized crime for 12 years, so-called South Pacific Cartel, which operates in Morelos. – Another case was asymptomatic adolescent Marco Ivan N., who was assassinated in Villahermosa, Tabasco, the PRI Jose Francisco Fuentes Esperon, a candidate for federal deputy, his wife and two children, when they slept, along with three other young people. Even women raped. – Just this past October 13th in Cuernavaca recaptured a juvenile who had escaped from a correctional facility, when robbed a gas station. This is Joshua N., 14. The Attorney General’s Office (PGR) said that so far the presidential term of Felipe Calderón Hinojosa had been arrested 26,000 856 children for having committed crimes under federal jurisdiction, mainly for drug possession and distribution and possession of firearms. The PGR clarified the figures given last August, when he reported that only 44 thousand had been detained minors. Other violations, such as tax, property, Federal Law against Organized Crime, for possession of firearms and explosives, the records indicate that the number of children have also been captured on the rise since December 2006 while the figure juvenile detainees was 51 for 2007, reported the capture of 864 children and in 2008 was one thousand 81, 531 and 2.009 million in 2010 two thousand 603; in from January to June 2011 have been captured under 402 thousand. PGR data reveal that most juvenile offenders are mainly involved in drug crimes such as trade, possession and consumption of drugs, as well as possession of a prohibited firearm. Those arrested for possession of firearms have been seized in raids usually in the north and almost always linked to Los Zetas . The Law for the Treatment of Juvenile Offenders (known as criminal justice for adolescents) believes that, regardless of the crime that the 17 years or less committed, the maximum of corporal punishment in the Guardianship Councils may extend until it meets 18 years of age after age with the majority of people should be released so forced the law says. “The criminal groups of Los Zetas and the Gulf Cartel are very weak tactically, operationally and financially in Tamaulipas,” that is what the spokesman for the Department of the Navy, Rear Admiral Jose Luis Vergara Ibarra said. Luis Vergara said this while talking about Marine operations on this region in recent days, that includes a confrontation in the town of Miguel Alemán that killed 10 suspected criminals and wounded 22. At the headquarters of the Navy situated in this border city, the admiral noted that the weakening of these criminal groups is reflected in the increased use of armored pickup trucks and because the members of these groups have no formal training in the use of weapons, and went on to say that they seem to have increasingly less resources. The admiral added that in the confrontation last Saturday in Miguel Alemán; “We did not have any casulaties or injuries,” and also said that they faced a group of men “who took up arms in a desperate way” and without any knowledge confronted trained federal forces. Vergara Ibarra said that from October 5 to date, the Navy has detained a total of 36 suspects and 11 more that were killed in clashes with the Marines, and they also managed to seized four tons of marijuana, 65 long guns, five handguns, 18,221 rounds of ammunition, two anti-tank grenades, four hand grenades, 35 rocket propelled grenades and an RPG with 324 RPG cartridges. They also seized four heavily armored trucks or homemade tanks, also known as Monster trucks. Gang activity is diverse in Austin,Bloods or Crips but the Bandidos! Gang activity is diverse in Austin. Street gangs like the Bloods or Crips are loosely affiliated and don’t have a set hierarchy. The Bandidos motorcycle gang and the Mexican Mafia prison gang, however, have set chains of command and power structures, according to police. In addition, there’s the up-and-coming Texas prison gang Tango Blast, which police officials say is becoming more of a cohesive force. But they’re all doing the same thing: selling cocaine, marijuana, heroin and methamphetamine brought to the U.S. by Mexican cartels, police and federal officials say. “A lot of the street sales (of drugs) around the country are supplied by Mexican cartels,” said Greg Thrash, who heads the U.S. Drug Enforcement Administration‘s Austin office. That includes about 90 percent of America’s cocaine and most of its methamphetamine. Thrash said that his agency’s investigations into Mexican cartels often uncover where their drugs wind up. He said that drugs can change hands several times, between several middlemen and wholesalers, between the cartels and street gangs. In other cases, the cartels deal directly with gangs, he said. Harrell’s interview with the Austin teen was part of a summer initiative aimed at coming up with a more accurate number of how many gang members are in Austin and gaining “street intelligence,” said police Sgt. Lester Vanzura. Vanzura said, the officers acquire new information each day and are developing sources who can provide information about higher-up gang members, violent crimes or large drug deals. Baker said, officers look at trends along the border as guidance for what may come to Austin. His concern, among the escalating crimes, is juvenile gang members. 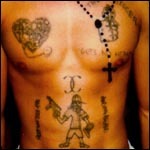 Police found an increase of about 14 percent in documented youth gang members, from 658 in July 2010 to 748 this July. Juvenile members are mostly involved with graffiti, which officers said is on the rise, and with displaying their gang’s colors. Baker said that juvenile gang membership nationwide may be on the rise again after a dip in the 1980s, perhaps fueled by cartel money that kids see as an easy way to make cash. But older gang members like to use kids in their operations because the juvenile justice system is more lenient, he said. The extreme violence on the Mexican side of the border — which has included mass killings and public executions of police officers and elected officials — has been over the fight to control the points of entry gangs use to export drugs into the United States. That’s why cities in Texas haven’t seen the killings and other crimes that have plagued Mexico, Baker said. Baker said he doesn’t think the increases seen in the Hispanic population in Texas and the United States have anything to do with increased drug cartel activity. But he said he’s concerned about what might happen when the cartels get territorial and decide to lock down a market like Austin — or when the local gangs start fighting over their drug supplies.